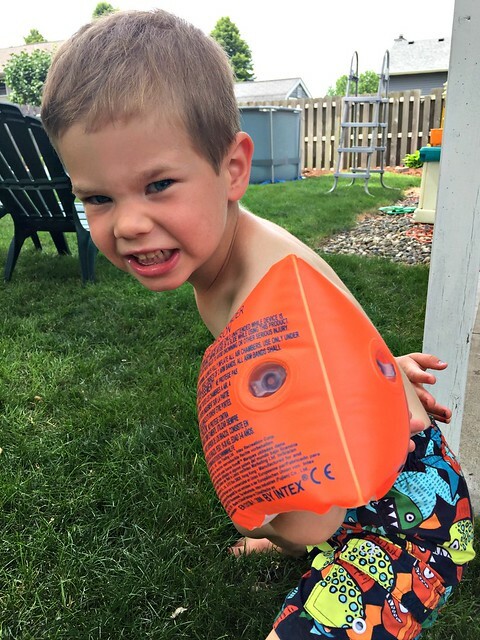 We Bought a Pool… Here Are My Thoughts! 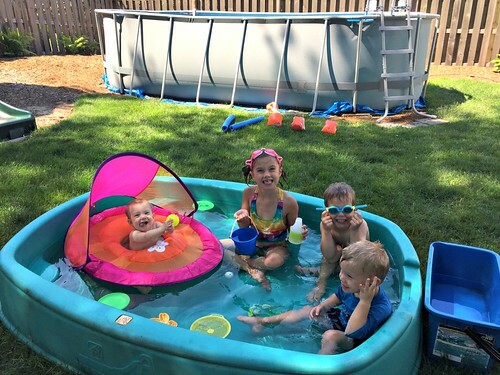 Since the day I first shared a picture of the pool we bought at Costco this spring, I have been inundated with questions and requests for a blog post about our pool. And although Dave is currently more “in the know” about our pool situation, I feel I have enough knowledge to share more with you — especially considering we shopped around for a pool like this for 2 years already! 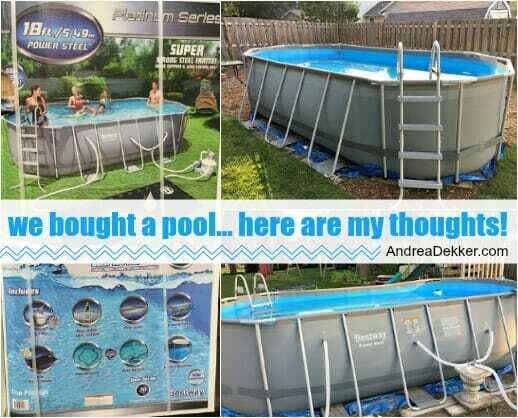 If you’re in the market for an inexpensive, temporary above-ground pool, I hope today’s post will be helpful for you. 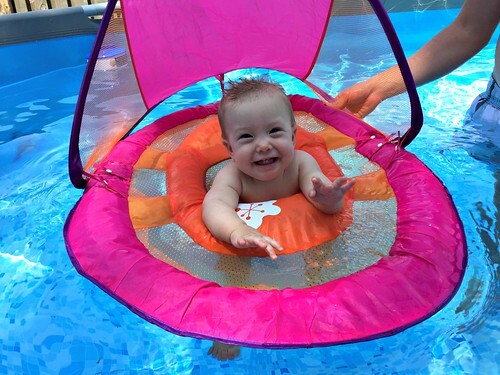 If you’re not in the market for a pool, I hope you enjoy the cute pictures of my kids! 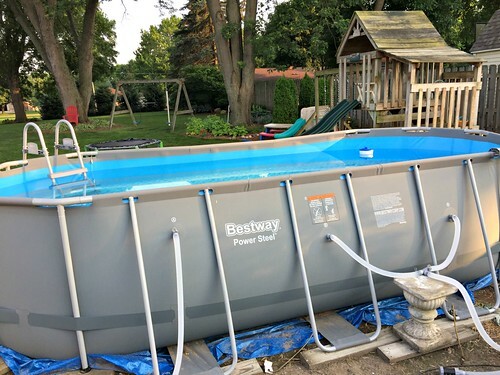 We purchased the Bestway Above Ground Power Steel Oval pool from Costco back in April. It was $499, and we’ve spent another $300 on various chemicals, a few little parts we needed, a tarp to go over the pool (because the cover it came with doesn’t fit), and a solar cover. Here is the link to our exact pool on the Bestaway website. The box is HUGE (almost as tall as me) so Dave needed to fold down the seats of the van and have someone at Costco help him load it. Of course, I got to help him unload it and “drag” it into our outbuilding for storage! The assembled pool is an 18 ft. x 9 ft. oval (48″ tall) — which is the absolute PERFECT size for the space we wanted to put it in our backyard. We needed the pool to be at least 10 feet from both our back and side lot lines and at least 10 feet from our outbuilding (per our city code). Also, we didn’t want to go through the hassle of moving our swing set — so our pool needed to be less than 20 ft x 10 ft. to accomplish this. We’ve had a heck of a time finding a pool small enough for the specific space we wanted to put it in, but big enough to actually accommodate our whole family plus a few friends. 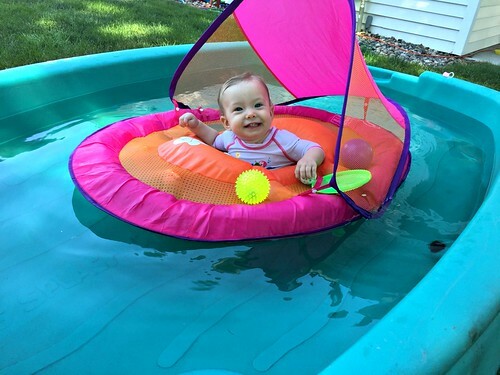 We knew an oval or rectangular pool would be ideal, but we hadn’t had much luck finding one until this spring! So like I said, this pool is the perfect size for our space, which is why we jumped on the deal when we found it at Costco this past spring! 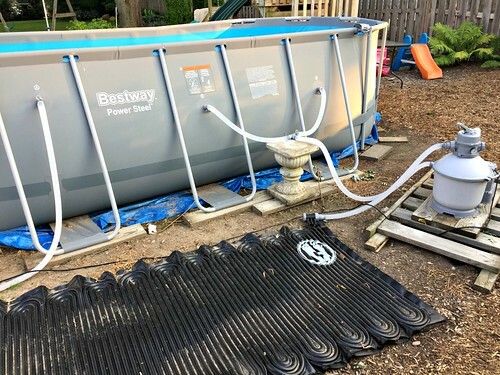 Our pool came with everything we needed for installation — including the ground cover, the ladder, the pump and sand filter, a solar heater, a vacuum, a skimmer, a cover, chlorine basket, etc. As I mentioned above, the cover didn’t fit (not even close) so we purchased a big tarp and use bungie cords to keep it on. Not ideal, but it works! NOTE: We ALWAYS remove the ladder when we’re not using the pool… and it’s way too heavy and bulky for our kids to move on their own. I put the ladder in for the pictures, so you can see how it fits. 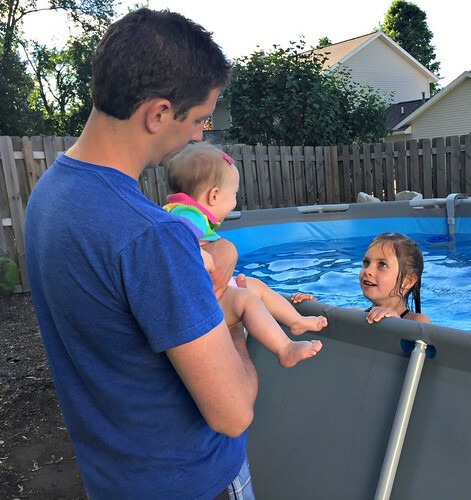 Dave and I have wanted a pool since we got married — even more so after having kids. I know it might seem silly to spend time and money on a pool when we live in Michigan and can only use it for 3-4 months of the year, but considering the fact that Dave is home ALL summer, I work from home, we love entertaining, our kids love playing outside, and we basically never travel anywhere, a pool is really a fantastic addition to our huge backyard. If it’s not raining and we’re not leaving to go somewhere, the older 3 kiddos are essentially in their swimming suits from 10:30 am until dinner time! And Dave jumps in the pool daily after his runs, after mowing the lawn or doing yard work, or just to cool off if he’s been riding bikes with the kids. This Bestway pool is definitely just a temporary pool until we save up for a big underground pool. Our hope is that this pool will last us a few more summers, at which point, we would ideally put in an underground pool. We’d like to do this by the fall of 2021, as we’ve been told pool installation is less expensive in the fall versus the spring. Plus, if we install the pool in the fall (September/October), we’ll have all of November to spruce up the landscaping, install a fence, and make it look pretty, so we can start swimming on Memorial Day the following spring!! 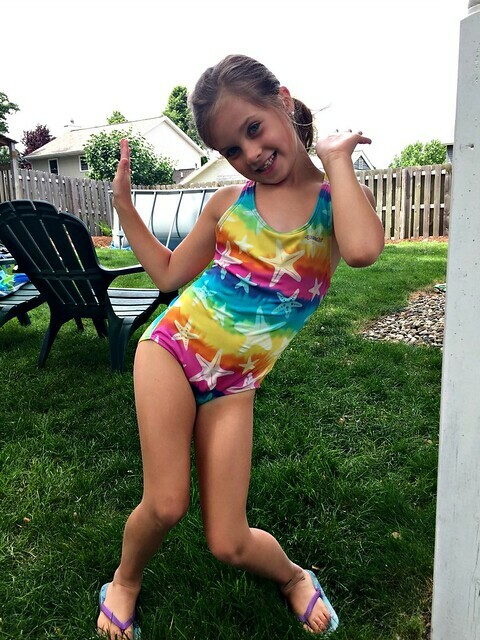 Plus, by that time Clara will be 4, and assuming she is our youngest child, all our kids will be old enough to understand pool safety and most likely all know how to swim. Of course, we definitely have time to change our minds or decide we don’t want an underground pool after all — but in the meantime, we’ll enjoy our very inexpensive pool all summer long! First of all, I should mention that the instructions that came with our pool were absolutely HORRIBLE. And the Bestway company had super long wait times when we tried contacting them for assistance. 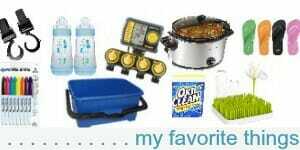 Thankfully, we have a great pool and spa store just down the road from our house, and the staff there helped us get everything up and running, and then helped us figure out what we needed for chemicals to make sure the water stays nice all summer long. Dave and I had a good laugh when we noticed the preppy couple setting up the pool on the Bestway website. This is NOT what you will look like when setting up the pool! You will be sweaty, you might get dirty and/or wet, you will probably say a few choice words, you will most likely feel slightly frustrated by the lack of instructions included with the pool, and you will definitely need more than 2 people to get this bad boy up and running! Dave spend a significant amount of time digging up all the sod for the area we wanted to put the pool. Then he leveled the ground and made sure there were no sharp rocks or big roots. My sister and brother-in-law came for the morning to help us set up the frame (it’s definitely a 3 or 4 person job), and then Dave spent some time getting the pump, filter, and solar heater hooked up. Once it was finally set up and ready for water, it took a full day to fill up! After we filled the pool, we had to get the water tested to figure out what chemicals we needed. Dave took water samples to our local pool place and their staff told us exactly what to do, what products to buy, how often to put the various chemicals in the pool, etc. Once the chemicals were in, we waited 24 hours and then let the kids jump in! Yes, it was cold… but it heated up quickly! 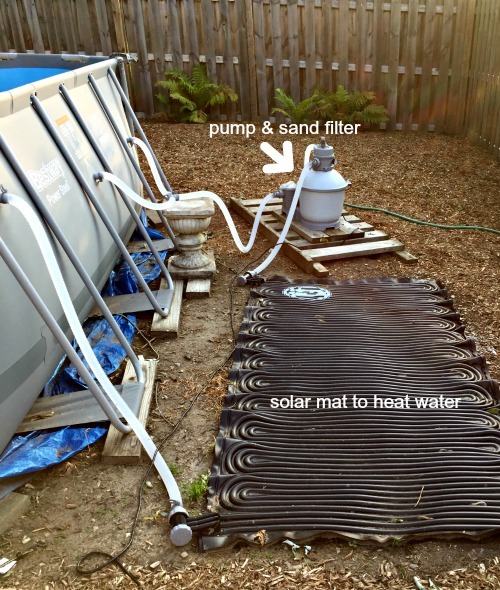 I’ll be honest, the solar heater was the thing that sold me on this pool — I HATE cold water! See that black pad in the picture below? The water runs through that and gets nice and toasty warm before entering the pool again — so if we keep the pump running whenever it’s sunny (which is often in the summer months) our little pool warms up quickly! It’s been in the mid 80’s for a few weeks now already, which is FANTASTIC for me! Heck, I’d even take 90º!! Technically, these pools are supposed to be fully drained, dried, disassembled, and stored for the winter. 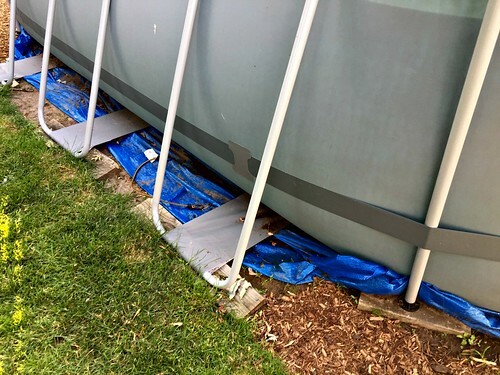 However… we have neighbors who simply drain the pool below the intake/outflow ports and leave it set up with a heavy tarp over top. I am personally leaning towards leaving the pool up all winter; Dave, however, thinks we should take it down. Apparently he would like to try setting it up a little differently next spring — so we’ll see what we end up doing! Either way, we WILL disassemble the pump, filter, solar heater, etc. and store those items in our basement for the winter. 1. Set up will most likely alway be frustrating and annoying. I have a feeling that anyone with any type of pool will say that the initial process of setting the pool up, cleaning and shocking it, and getting it ready for summer is somewhat frustrating and annoying. That’s just part of having a pool. After that first week, then it’s usually fairly smooth sailing for the rest of the summer — so definitely worth a week of frustration in my opinion! 2. Work with a pool company you like and trust. We had so many questions in the beginning, and our local pool store helped us SO much. Not only did they explain many things we didn’t understand from the pool instructions, they also helped us test our water, and figure out a good routine for adding chemicals. 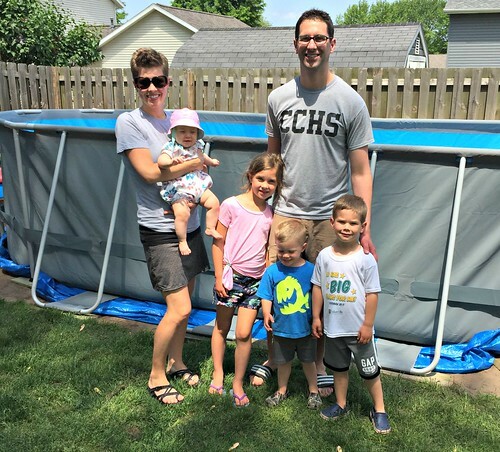 We may have paid a little bit more than if we just went to Meijer or Costco for our pool chemicals, but we got great service and expert advice. Hopefully we’ll be able to give the pool store lots of business over the next 20+ years!! 3. Realize that “you get what you pay for”. Dave and I are VERY happy with our purchase (so far!) and definitely feel like this pool has been worth $500. However, you really do “get what you pay for”. This pool is fairly small — so if we invite friends over, we just invite 1 or 2 families at a time so it doesn’t get over-crowded. Also, other than jumping off the ladder, there is no place for the kids to stand and jump into the pool (and they really like to jump in). We’ve thought about trying to build a little platform at one end — but decided we’re just going to be content with the pool this summer. Maybe next year we can add the platform! And finally, the materials for this pool definitely aren’t as sturdy as a more traditional above-ground pool — which is fine, but just something to note. 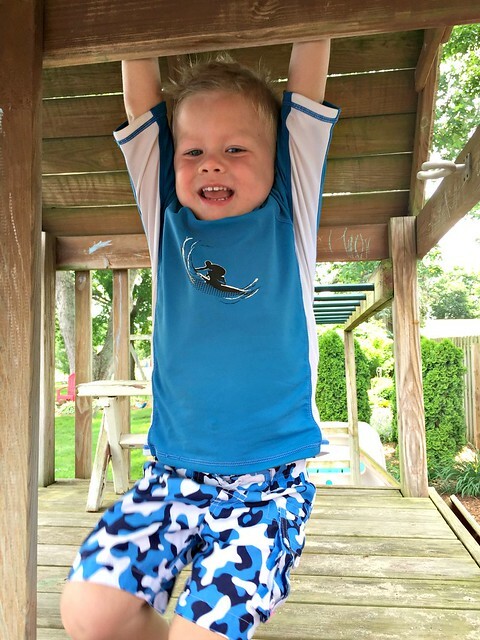 Like I said above, Dave and I are very happy with our purchase, but there are times when we have to remind the kids that they can’t push off the side of the pool wall or hang onto the pool railing because it literally jiggles the entire pool! 4. Be prepared for regular maintenance. However, I can honestly say I’ve been pleasantly surprised with how well the pump and filters work, and the minimal amount of effort we’ve had to put into cleaning it. Dave and I both skim the pool regularly when we’re in it, when we’re playing with kids outside, etc. etc. and we’ve each vacuumed it a handful of times already, just to keep the bottom nice and clean. Dave has taken on the role of “pool boy” this summer and is the one in charge of adding chemicals and getting the water tested at appropriate times — so far, it hasn’t been too much of an inconvenience for him. 5. Keep your kiddie pool. With our new bigger pool, we thought we might not need our kiddie pool anymore… but we are definitely glad we have both for now. 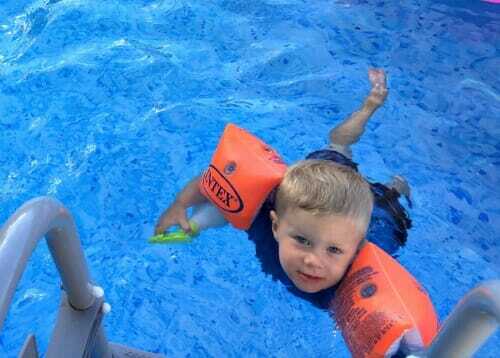 Also, the kiddie pool is great for using on random hot days in the spring, when our bigger pool might not be open yet. 6. Think twice before buying used. You know me — always the one to buy used versus new! Dave and I were originally hoping to buy a used pool, as they are ALL over the place on Craigslist in our area. 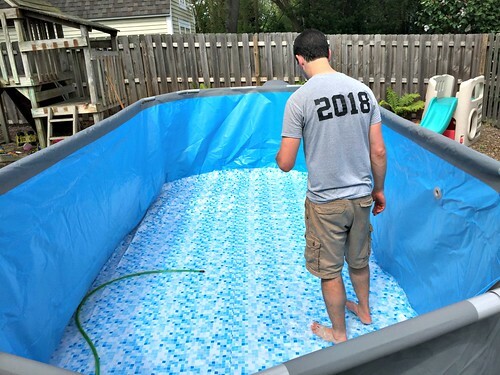 However, we were always somewhat leery about the process of setting up a used pool with no instructions, no guarantee there wasn’t a tiny pinhole or crack somewhere in the liner, and no way of knowing if we actually had all the parts (or what parts might be missing). I’m super glad we went for a brand new pool (even though the instructions were still very lacking). 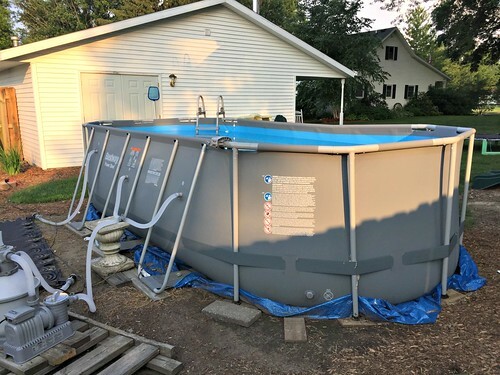 It was nice to know we could register our pool, get the warranty, be assured everything was actually in the box, and have Costco’s money-back guarantee. 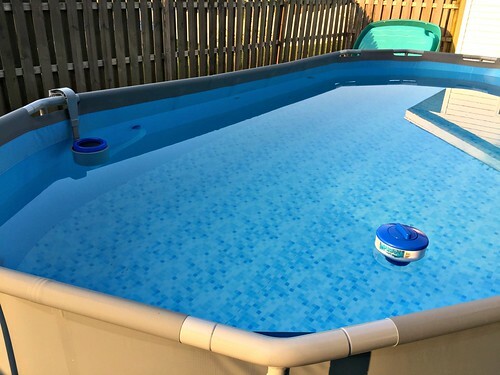 Also, it’s worth noting that anyone selling a pool like this “without the liner” is just a scam. 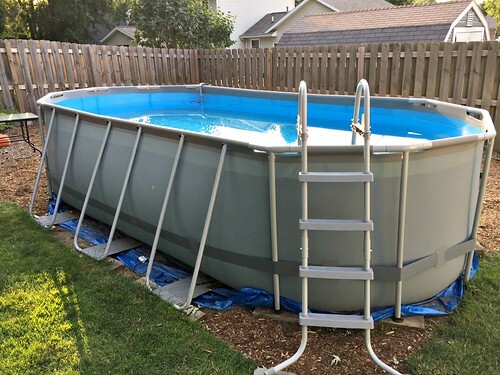 This pool is basically a liner on a frame — so if you just buy the frame, you’re screwed as I currently don’t know of any place that you can buy just a liner for these types of pools! 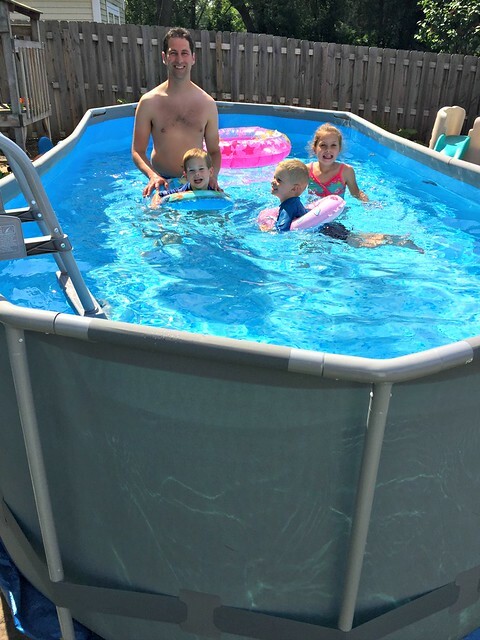 All in all, we are EXTREMELY happy with this pool purchase and would definitely recommend this frugal option for anyone with little kids who love to swim! Seriously! I don’t even know if you know how cute you guys are! We need more people and families like yours out here in Southern California! Ah, I only hope and pray to send some of your wisdom my girls’ way when it’s time for them to have a family! 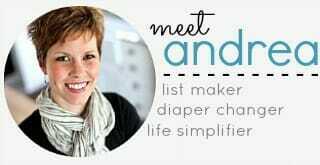 I’ve already raised my girls (now 19, 21,22) but I absolutely thoroughly enjoy your blog. I skim over some lunchtime food choices for the little ones..haha (actually, I still love the ideas..ha!)! But, other than that, there is still plenty for me to enjoy, admire and mull over. I am very much your same personality but I was not on IT like you are at your age/stage. My girls all came within three years and I was off and running…gosh, I wish I had simplified sooo much more back then!! You absolutely ROCK! And, make having four kids look so easy! They are so blessed to have a mother and father running the household like you two do! You and your kids experience so much pure joy by slowing things down and not trying too hard to do too much ALL the damn time! (I was more go-go-go!) especially while they are this young. We had passes to Disneyland…haha!!! 🙂 Enjoy the latest fun “toy” at the house! Leave it up!! is my vote. We have had above ground pools for over 10 years and love having pool/bbq parties. The whole family enjoys it. 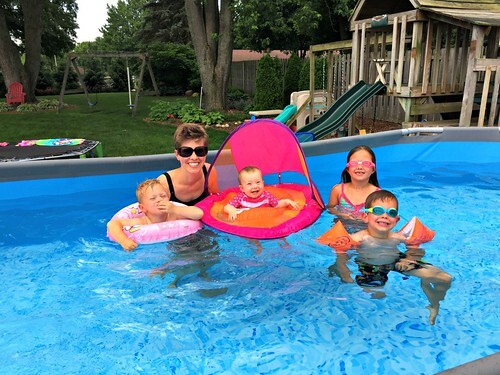 We have 14 grandchildren and the funniest thing they want to do is the whirlpool- everybody(adults) runs the edge of the pool and creates a lazy river! the kids thoroughly enjoy this. Great family bonding times, and the children are watched! Fun for all. we did pour a 18″ ring of concrete around ours and laid sand in the middle. On the days I am home alone I will get out in it all by myself and enjoy that also(these days are few and very far in between) lol I am a stay at home grandma by choice so very busy and we love our pool! enjoy!!!! I’ll pass your vote along to Dave. Thanks Cathy! We had been talking and planning for a pool 2 or 3 years now. We even got a couple of bids, one before the fall and one right before spring. We decided against it all together because it shocked us on how much it would cost and thinking how much longer it would take us to pay off our mortgage. Your post, an invite to our friend’s house with a newly built underground pool, and our current heat wave makes me want to revisit this plan again. We designed a kidney shaped pool just because of how it mimics nature. We also wanted salt water and one company who submitted a bid talked us against it explaining it causes more issues with rusting and break-down. The other company didn’t talk us against it but explained the pros and cons. The kidney shape also would cost more than a rectangular design, but I just imagined how much pleasure it would give me just to look at the water and it looking like I was by a lake. A pool would cut down yard maintenance (mowing, watering, fertilizing, etc.) so that’s a plus. I’m not sure how much the water bill or the electricity would increase though. The value of our home wouldn’t increase either by adding an in-ground pool, and it might even deter future buyers since we’re living in WA state. This will purely be a luxury addition. haha — well don’t do it because we did it. Our investment was VERY SMALL this year — we definitely won’t dive into (pun intended) an underground pool purchase without lots of thought! We have an in-ground 20 x 40 and 10 1/2 feet deep. It came with our house. 🙂 We struggled for years with getting our chemicals correct and spend tons of money that was not needed. We had someone tell us to switch to Sam’s Club chemicals and the difference is amazing. We use half the chemicals and never see green, which was always an issue in the past. 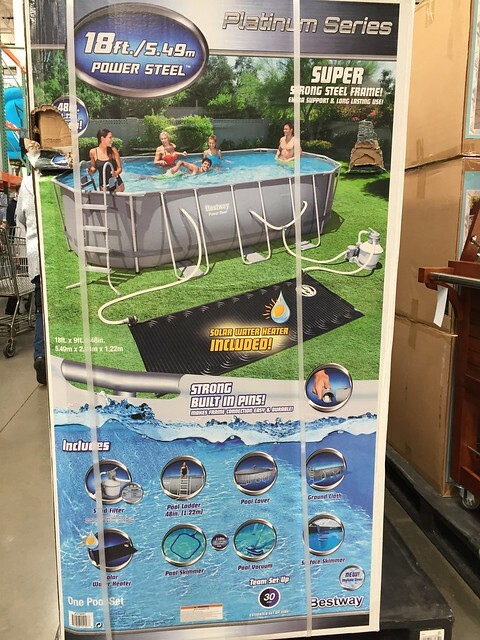 Sam’s Club chemicals have made a huge difference over pool supply chemicals. Just a suggestion if you have issues! wow — that’s a HUUUUGE pool! good to know about the sam’s club chemicals! My sister has a membership so we could always buy through her to test them out! We’re also in Michigan and I can cast a vote for leaving the pool up all winter. We’ve had about 10 years of various above ground pools and used to take them down every fall. The following summer we would have lots of leaks and holes to deal with. Our latest pool is much larger, similar to yours except round, and we’ve left it up for the last 3 winters and have not had a single leak or problem. I highly recommend it! good to know — thanks Lisa! We had an above ground pool put in 3 years ago. We adore it and so do our kids. I agree with your comments on working with a local pool store. 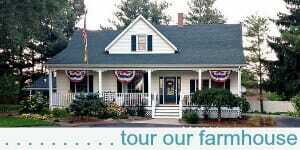 After 2 seasons we feel pretty good at handling the care and maintenance but it is always great to have a trusted source to go to for help! Also, Costco runs a great sale in late spring/summer on buckets of chlorine tablets and bags of shock (delivered for free). We always buy one of each at the beginning of the season and they last us all year! Good luck! PS – we live in Cleveland OH so yes, the season is limited, but we get in there everyday we can! good to know! We hope we will love having a pool for many years as well! How has your electric bill been? 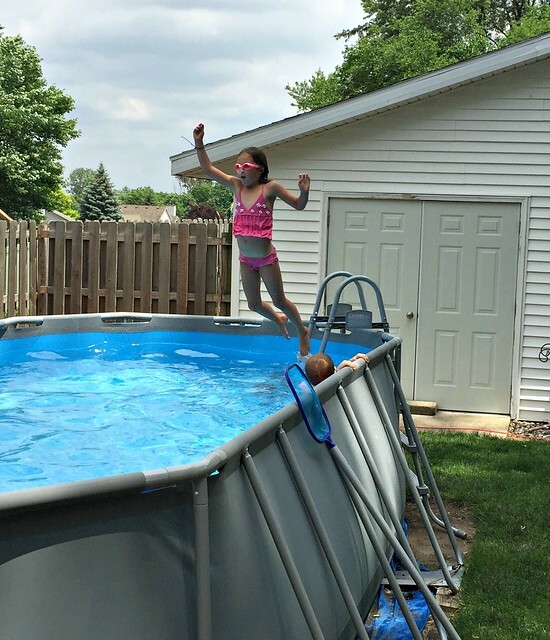 When we bought our home there was an above ground pool – it had to run at least 8 hours a day – every day. And then there were the lightening strikes and algae and fun stuff like that. I think the last summer we used the pool was 2004 when my girls were 2. Then we shut it never to open it again. But we did join the town pool. Fun and no responsibilities! We haven’t noticed any difference at all — that said, we run our AC and underground sprinklers daily in the summer as well, so our bill is always higher in the summer. I think I read that a pool pump uses roughly the same amount of energy as a refrigerator — so no big deal at all. We often keep our pump running all day long. I was wondering how many gallons of water that is? I have thought about a pool, but the cost to fill it has to be considered. If it took a whole day to fill it…do you have to add water very often? Looks like everyone is enjoying it! I’m honestly not sure how many gallons — but our water bill was maybe $20 more than normal for this time of year (so basically nothing!) We’ve added a little water to it once so far. Wow, that is not bad at all. I was expecting over $100! I may have to look for one on sale as they clearance things out. Wow! We have friends with a pool and it cost them somewhere around $600 to fill it! Granted, it’s probably twice the size of yours, but still. I guess water costs vary a lot depending on where you live! The trick to keeping the pool clean is to use it a lot. My parents had an in-ground pool and the summers that people were in it everyday, they never (well, hardly ever) had to actually clean it. 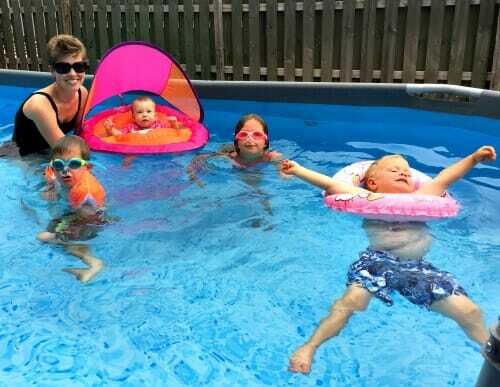 Then as the kids/grand kids grew up and got busier the pool was used a lot less. That is when it got really green/dirty and cleaning it became a chore that had to be done all the time. Then pool maintenance became another reason they wanted to sell the house they were in. Have fun with it! yes! We use it a lot!!! Yes, whenever we get an inground pool, we definitely want to get the salt system. However, after doing some research, we decided agains a salt system with our current pool because it was said to rust the metal frame. Glad to hear good reviews from you though! I also heard about the rusting on the metals with salt water. Have you had any issues with this yet? I love this! I am definitely not a “pool mom”. I don’t enjoy swimming or the heat as I sit by the pool, but I think your kids will love the memories they’ll make with a pool! 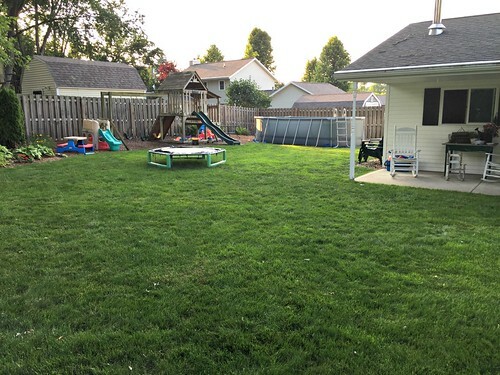 Believe it or not, when we moved to Maryland, we actually paid good money to have the inground pool that was our ENTIRE back yard, filled in and covered with sod! 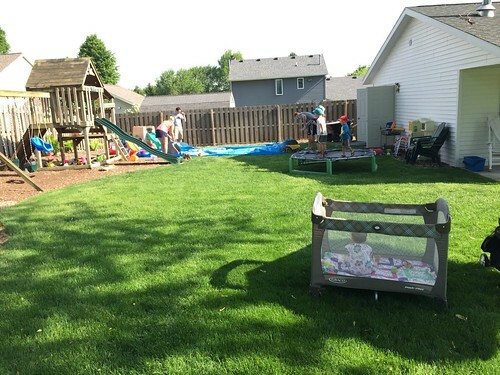 We took a lot of heat for that but, at that point in my life, I was more interested in the kids having grass in the yard, and my introverted self did NOT want to be party central! LOL! We did join a neighborhood pool pretty much every year while the kids were young and they enjoyed that a lot! They always had friends to play with there and I always had someone to chat with in the shade. My sister and brother in law have a beautiful inground pool in their backyard, and it’s been the landing place for many parties and gatherings over the years. When we lived in Maryland, we were just 2 hours away and spent many weeks/weekends at their home when the kids were younger. 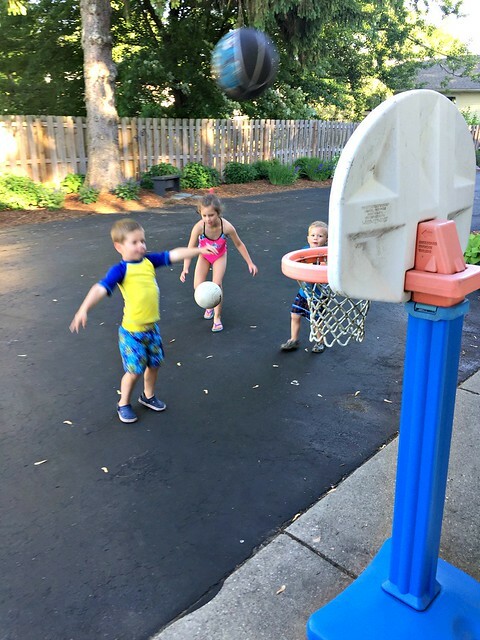 Those are great memories, and I know your kids will have the same! 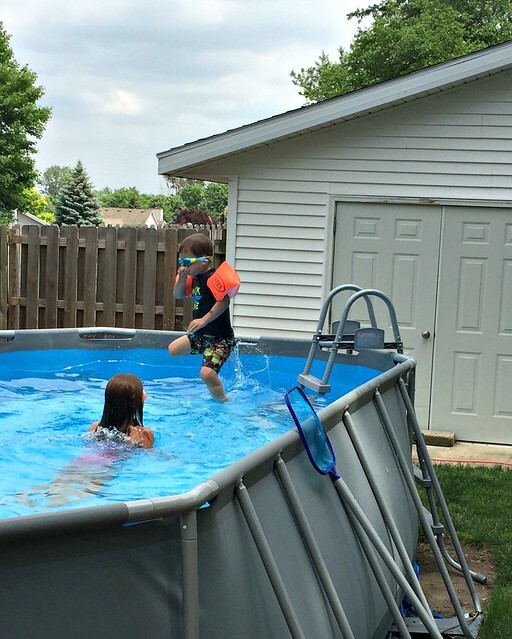 We have friends who filled in their pool too — we were so jealous!